I grew up in the 1950’s and 1960’s at Wilsons Creek, up in the mountains out from Mullumbimby in Northern New South Wales. I was raised on a banana plantation amidst the steep slopes of rainforest and wet sclerophyll (gum) forest and occasional cliff outcrops. The creek we swam in was a very clear, clean freshwater rainforest creek with big deep pools. People now in the City, would give their `eye’ teeth for it as my late father used to say (see photo above). 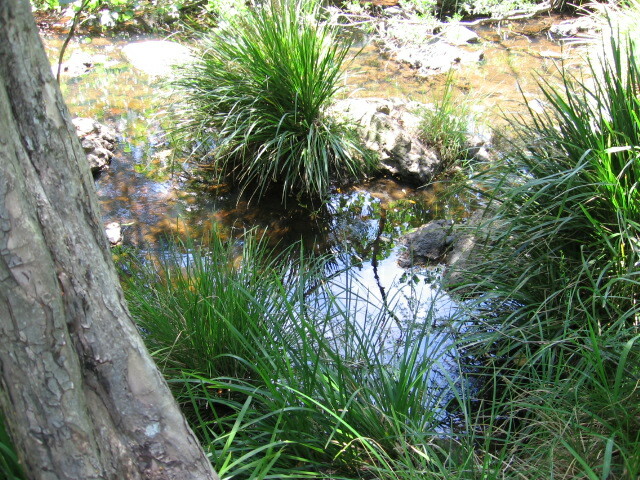 Wilson’s Creek is about twenty minutes (about ten kilometres) up in one of the many valleys west of Mullumbimby, in the Northern Rivers area. With this time, came for me a strong spiritual love of Creation, Nature, Country Living and the Environment. It was a hard and simple life with a Dad and Mom and three younger brothers (Gerald, Rick and Colin). My father had come through the Great Depression of the 1930’s. His father had died when he was only thirteen and he had had to leave home and fend for himself. He had learnt many lessons of self-sufficiency …. personally and economically. We lived in this before Dad built the house across the creek ….. (equivalent to the caravan Harriet and I lived in for four years on our land from 1977 to 1981 in Brisbane) ….. There was Dad, Mum and I plus Gerald (born in 1952) and Rick (born in 1956) who was one year old. We lived in this two roomed converted banana packing shed for a number of years from 1950 to 1956 ….. Colin was born in 1958 in the new house across the creek … It had cream painted tar – paper walls on the wooden framing and a simple system of 12-volt lights for lighting. Dad used to charge up a number car batteries in the engine room across the creek …… They were placed serially in line to maximise the power. My bed, more settee was in the first room of the house ….. outside were just unpainted, greying and overlapped weatherboards ….. on the roof was a grey galvanised tin roof in typical packing shed construction …… it was raised up a metre or so off the ground on wooden stumps …… I remember catching mice in the mouse trap under this house …. I was only five years old at the time …. There was an outdoor timber toilet above the house with a cream painted toilet seat placed over a small drum bucket …. water for drinking was obtained by walking down the hill about fifty metres down to the creek and getting a square kerosene bucket of water …. A really laborious chore of bringing the water from the creek. ….. Then leaving it on the ramp landing to the front door. I was only seven years old and I was reading a book one day on a bear who had many adventures and went fishing and caught a fish …. Going to Dad’s draw one Sabbath afternoon … (we were Seventh Day Adventist Christians and never went doing things like this on Sabbath). Dad was away somewhere … opening the draw and cutting off a couple of feet of thin twine …… making a bent pin hook … finding a worm for bait …. 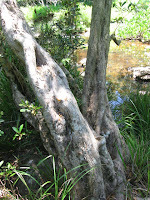 going down to a fork in a water gum tree below the old crossing over a shallow pool (see photos above) and letting my line dangle in the water with a worm on the bent pin …. pulling the line up later and there was a mud gudgeon (a small brown fish about 100 mm long) on the end …. it had swallowed my bent pin totally … my first fishing effort …. I was only seven …. And wasn’t I excited !!! The photographs above are of the forked watergum I sat in above the pool. The photograph was taken in January 2006.